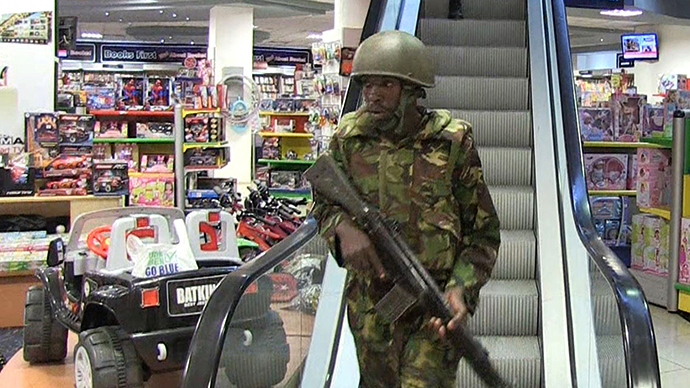 The Kenyan military has reportedly taken control of Nairobi's Westgate shopping mall. Over 200 civilians have been freed and over 60 killed during the three-day bloody hostage crisis in the Kenyan capital. “We're in control of Westgate,” Kenya’s interior ministry said in a post on Twitter. "We think that everyone, the hostages, have been evacuated but we don't want to take any chances," government spokesman Manoah Esipisu previously told AFP. The military earlier said that all possible escape routes were sealed and the attackers’ chances of escape were very slim. Four powerful explosions rocked Nairobi’s Westgate mall on Monday, followed by gunfire. The explosions caused dark smoke to rise from the building. The evacuation of hostages “has gone very, very well” and officials believe that there are few if any hostages left inside the upscale mall, Kenya's interior minister told reporters. At least 62 people – including foreign nationals – have been killed and 200 injured in the building since the siege began on Saturday. Another 63 people are reported to be missing, the Kenyan Red Cross reported. Eleven Kenyan Defence Forces soldiers have been injured in the rescue operation. The attack was claimed by Somalia's militant group Al-Shabaab, which has links to Al-Qaeda. It said the hostage siege was a response to Kenyan military operations in Somalia. The group had previously threatened to strike the mall - a popular destination for the city’s expatriate community. 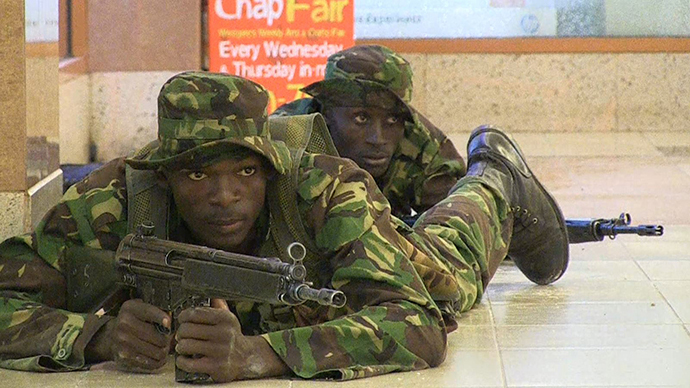 Kenyan troops are reportedly in charge of all the floors of the shopping center, but ten to 15 gunmen may still be inside. Chief of Defense forces Gen. Julius Karangi called the gunmen “a multinational collection”. He said the attackers had set the fire with mattresses in a supermarket inside the mall – the smoke from which was seen above the building - as a distraction but will not evade capture. The dark column of smoke followed the blasts on Monday while law enforcers’ helicopters and a plane were hovering around the Westgate mall. Earlier, it was reported that a woman was among the attackers. However, Interior Minister Joseph Ole Lenku said that some male militants disguised as women. He told reporters that two "terrorists" were killed on Monday and another assailant died on the first day of the bloody siege. On Sunday, Kenyan troops launched an assault on cornered militants, despite the warning from the attackers that they would kill hostages if police moved in. Police said they feared the death toll from the siege could become higher, after hearing reports of multiple corpses inside the building. 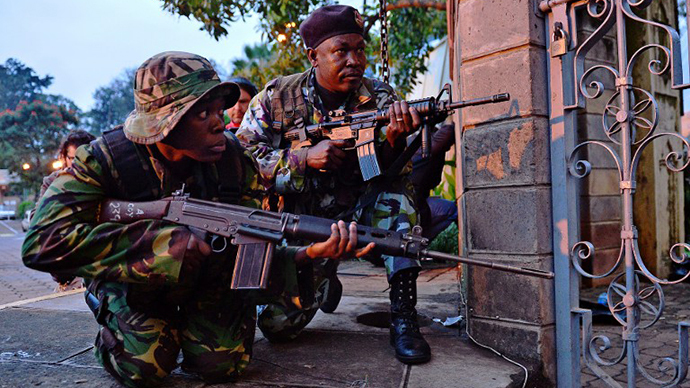 Israeli advisers are reportedly helping Kenya determine a strategy to end the mall siege. "There are Israeli advisers helping with the negotiating strategy, but no Israelis involved in any imminent storming operation," an Israeli security source told Reuters. Meanwhile, neighboring Uganda - which like Kenya has also sent troops to fight Islamist militants in Somalia - has stepped up security after the Nairobi hostage crisis. In 2010, Uganda became the site of a double bombing organized by the al-Shabaab group, in which 77 people were killed. “We have generally stepped up security across the board in terms of streamlining border security so that we plug all the loopholes at entry points that could be potentially exploited by these characters,” said Ugandan army spokesman Lieutenant Colonel Paddy Ankunda, as quoted by Reuters. Among the victims of the attack are citizens from the US, Britain, France, Canada, Australia, China, South Korea, India, South Africa, the Netherlands and Ghana. Five Americans were wounded. “We should prepare ourselves for further bad news,” said David Cameron, the Prime Minister of the UK which lost at least six citizens in the deadly siege. The wife of a foreign service national working for the US Agency for International Development was killed, US officials said. FBI is also investigating if any of the attackers were US citizens, after media reports alleged that some of the names of the gunmen tweeted by Al-Shabaab during the siege appeared to match up with the Twitter handles of Somalian immigrants living in the US. Kenyan President Uhuru Kenyatta said the attack sought to intimidate and divide the nation, but stated that the "terrorists" will be defeated. The president added that he lost "very close family members" in the mall shooting. "The despicable perpetrators of this cowardly act hoped to intimidate, divide and cause despondency amongst Kenyans," Kenyatta said in a televised address to the nation. "We have overcome terrorist attacks before. We will defeat them again." Masked assailants armed with AK-47s and grenades launched their attack on the Westgate shopping mall around noon on Saturday, reportedly targeting non-Muslims. Gunmen were said to have lobbed grenades at the onset of the strike. They then proceeded to shoot indiscriminately and held a number of people hostage. Armed police arrived on the scene nearly half an hour later, as scores of shoppers were fleeing the building. Some of the wounded were wheeled out on stretchers and in shopping carts. "I personally touched the eyes of four people and they were dead. One of them was a child. Its carnage up there," said a former British soldier at the scene. The siege marks the largest terrorist attack in Nairobi since 1998, when a bombing at the US Embassy left 213 people dead. Al-Qaeda claimed responsibility for that attack.